Originally, I'd planned on having all my turnouts operated manually. I use Micro-Engineering turnouts and they have the handy-dandy built-in spring that will hold the points which ever way you throw them. And they work out great - and prototypically - on the Valley Line, but it occurred to me sometime during construction of the Saybrook scene (not to mention the Saybrook Tower) that it'd be really cool - and more prototypical - if the turnouts in Saybrook were thrown remotely by the towerman. Well, that would require the installation of switch machines, as well as the running of all those power lines from each machine to a control panel (which would, incidentally, be located above my agent/operator's desk on the other side of the room). It's not the best photo, but it gives me a start. 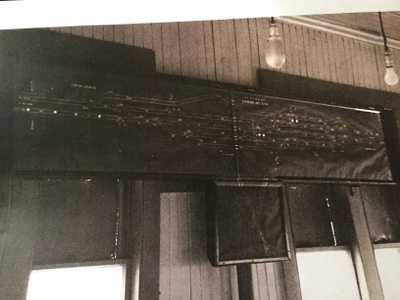 Unlike most model railroad control panels, which are basically single-line track schematics, the prototype had two lines representing the track. 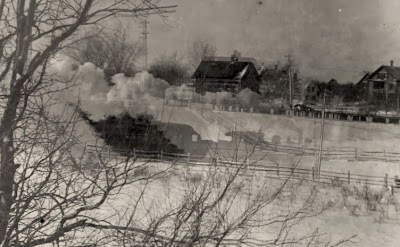 I also see - by zooming in - that the location was called "Saybrook Jct. Conn." rather than "Old Saybrook" and "NYNH&H" was on the top rather than "New Haven Railroad" or otherwise spelled out. And - interestingly - it looks like it's printed on some kind of paper. One of the challenges I've had is figuring out how best to build the panel. Traditionally, you'd paint your board a light color (white), use narrow tape to mask where the track goes, spray the board again a dark color (black), and remove the tape. But I couldn't find any narrow tape, didn't want to make it, and the result of all that work wouldn't match my prototype anyway. So I decided to follow the prototype and print my panel out on paper as well. At first, I tried the Paint program, but couldn't figure out how to do the "2-line" track - or how to get it to draw white lines on a black background. I must be dense impatient, so I tried Atlas' Right Track track planning freeware. I'd remembered that it can draw track with two lines like I needed, and it was also easy to figure out how to do white on black. Bonus: it (like most Microsoft programs now) will "Print to PDF" - just what my local Staples needs in order to print it to the size I need (12"x24"). Here's where I am so far. I just hope it's not too crowded for toggles and LED indicators. I'd originally planned on locating the toggles on the turnouts, with LEDs on each diverging route. Now I'm thinking it'd be better to just have a row of toggles along the bottom. But then I'd have to number each turnout, which would clutter things up further. And since this is track planning software I'm using, this is actually "full size" track on a 4'x8' table. I'm hoping that the print shop can just scale it down and print it to the 1'x2' size I need. Once I refreshed my memory on how the program works (it's been a couple years since I used it), I was able to do this in an evening - not too much time invested yet. Sooooo..... if you have any recommendations for any better way of going about this, please let me know. Next step may be to do a test print to see how things really look . . .
.... And listening to "SUSPENSE" from October 23, 1947. Air Line Local with R-1b #3339 on the Valley Line backing into Middletown Yard. Since I've been busy enjoying our New England Autumn lately, I haven't worked too much on the layout, but with a little help, I made some significant progress on powering the switch machines in Saybrook. While the Valley Line is all-manual as far as turnout control goes (I use MicroEngineering turnouts with center-over springs on the points), I wanted the Saybrook switches to be powered by "Saybrook Tower" - just as on the prototype. I think it'll be a cool contrast for a crew to go from the 74-train-per-day Shoreline and mosey up the branch. Getting clearance from the Tower each time you need to switch a switch (and having the towerman actually throw the switch for you) will go a long way to supporting that illusion. So, while most (sane) people have their powered turnouts controlled by a toggle on the fascia near the turnout, I need to have all my toggles on a control board in the "tower" on the other side of the room. That means I need to have two power wires going from the toggle all the way over to Each And Every switch machine. For someone that enjoys the simplicity of wiring that DCC and manual turnouts affords, all this "extra" wiring is a pretty daunting task. But with Pete's help - and a little bit of patience (and a lot of time) - it's not at all difficult. And if you keep pretty zen about it and work methodically, it can actually be a joy therapeutic not too bad. I ran lamp cord (which has two wires) to each machine, one at a time, and temporarily labeled each wire as I went to keep track. The other end of the wire is labeled the same. Here they are dangling waiting for me to install the terminal strip on that board and attach them all. 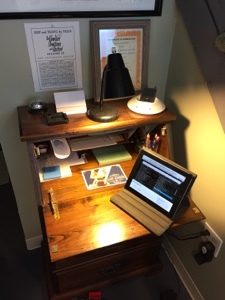 The "bridge" is a 1x2 L-girder mounted to a piece of plywood that provides a mount for the hinge. You can see the other end here - the bridge's 1x2 subroadbed is cut back to allow smooth entry into the receiving slot. This is the first time I've done a drop-down (as opposed to a simple lift-out) and I'm pretty happy with how it's come out. The key is to have the mounting for each end be absolutely rigid. Then, once you have things all lined up, it's just a matter of laying the track right across the gaps and cutting the rails in place. That's what I'll plan to do next so we can get the Air Line's "New Haven extension" finally done. Palmer, MA station on the former Boston & Albany (where the Central Vermont crosses). The station has been restored to a must-see/must-eat-at restaurant called The Steaming Tender. The "blue cabooses" in Deerfield, MA, along the B&M's Connecticut River Line. Visiting these is an annual event for me and the Missus (I get this same shot every year going back close to 20 yrs now). East Deerfield Yard on the old Boston & Maine, now PanAm/Norfolk Southern. Some pretty cool power laying over. East Deerfield Yard from the "Railfan Bridge"
Former New Haven Railroad freighthouse in Shelburne Falls, MA - now the site of the Shelburne Falls & Colrain trolley museum. #10 originally ran on the SF&C and has been beautifully restored and is fully operational. Hoosac Tunnel, MA on the former Fitchburg RR/Boston & Maine. I haven't visited here in probably close to 20 years, so I'd forgotten how impressive it is. This is the east portal and very accessible (unlike the western portal). Used to be double-tracked, and electrified during the steam era. Looking east from the tunnel at some beautiful foliage. Those are former catenary towers along the left. Bridge over the Deerfield River just east of the tunnel. The Hoosac Tunnel & Wilmington Railroad connected with the B&M on the other side of the river. Looking across the bridge at the former station site. The HT&W branched off to the left to head north to Wilmington, VT. Heading over to Adams, MA I happened across the Berkshire Scenic Rwy's new operation, including this recently-restored Budd Car. In New Haven RR green & orange, the BSR's SW-8 switcher provides the power. Unfortunately, either they weren't running that day or had already ended ops. Beautifully restored station at Adams, MA with the end of the BSR foliage train on the main. Living in southern New England this time of year is like living in Disneyland, between the beautiful foliage, the quaint villages, and the railroading. I haven't even gotten to the steam train yet, but that's coming. I tend to follow the foliage as it peaks from north to south, so I have a little bit of time yet before it gets to the lower Connecticut River Valley. In the meantime, I'll soak up all the modeling inspiration I can from these sojourns outside of the basement. 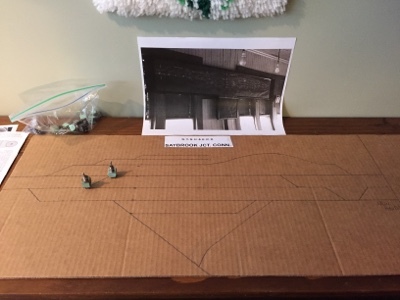 Turns out, it was easy - just a matter of having someplace to anchor your trammel, and somewhere to position your subroadbed for marking. Incidentally, my trammel is just a yardstick with a screw at one end and a pencil-in-a-hole at my desired radius. I've seen variations of this where the pencil is guided by a binder clip clamped onto the yardstick (so you can clamp it anywhere you want). My subroadbed curve needed about 6" of tangent to get to the doorway, so I offset my tangent line from the curve centerline and freehanded a short easement as above. Next, I marked the edges of the subroadbed so I'd know where to cut. Normally, this doesn't have to be that precise, but I may have this track be on top of a fill, so I didn't want excess subroadbed "overhanging" too much, needing to be trimmed later. Based on some quick research, I determined that 2 1/2" is the correct width for the top of an HO scale, single-track fill. Thus, I needed to cut at 1 1/4" from either side of my centerline. One way to do that is to use a compass - put the point on the centerline and the pencil 1 1/4" out. But I didn't have a compass handy, so I used my ruler . . . Pro Tip - Turns out, two of the holes are spaced exactly 1 1/4" apart. So it was only a matter of putting my Sharpie in one hole and guiding the ruler along the line, using the other hole as a window. Alternatively, you could just follow the centerline with any marking on the ruler to get a different distance. Here's the subroadbed, ready for cutting. After my nice S curve was cut out and spliced to my 24" curve (using a plywood splice that is 4x longer than the width of my subroadbed), I glued down cork roadbed following my centerline and tacked it in place to dry overnight. Now comes the fun part - installing the subroadbed/roadbed. It's just a matter of placing it in place, leveling it out, and screwing it all together. But be sure you know where your risers are going beforehand! I guess I could have just used a block of wood as a riser on top of the plywood here, but I like how easy traditional risers are to adjust. So I cut out a section to allow use of a traditional riser. Just remember to cut out enough so you can still screw it into the subroadbed from below! Now that the subroadbed is up to and through the wall, it's time to deal with the doorway and dropdown. . . .